September 10, 2018, Union Lobby, 10 a.m. - 2 p.m.
How Do I Know Who is Attending the Fair? To see and search the list of attending organizations, use your free Handshake account. You will have information about the organization, what they are looking for and a link to their website (information is entered by the employer or school). Dress professionally and bring several resumes. 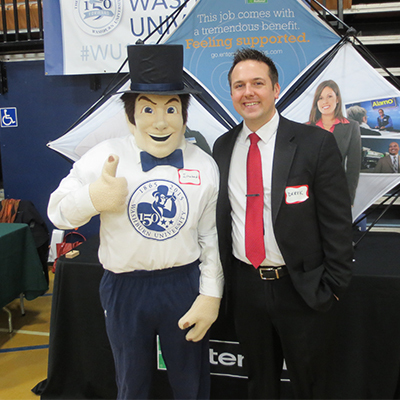 You are strongly encouraged to have your resume reviewed by WU Career Services before the fair. Call 785-670-1450 for an appointment. Job seekers will have the opportunity to discuss job opportunities with employer representatives and graduate school representatives will be available too. Opportunities may include full-time, part-time and internships. Career Fairs are excellent opportunities for career research. See what opportunities are available for your major. Network with employers. Make your own good first impression. Please do not attend this fair only to "trick-or-treat" for freebies. Employers have commented on the number of attendees who do this, and it reflects poorly on the Washburn community. In addition to the Fair, stop by the Graduate Salute for everything you need for graduation. You will find class rings, cap and gown information, diploma frames and information on becoming members of the Washburn Alumni Association. These organizations typically attend the fair to provide assistance with rings, announcements, commencement regalia, and alumni services.